Jenifer L.Armentrout is my bookish hero. Not only did she write my second favourite series of all time Obsidian, she also wrote this. Bless this woman. The plot of this book was never boring. It followed Alexandra, who's mother took her out of her school for reasons unknown at the beginning of the book. When her Mother dies she is taken back to school to be trained as a soldier, something that she very much wants to do, so she may avenge her mother. There is a serious plot twist in the middle of this book was not as much as a surprise as I was hoping to but that was only because I read the book blurb one too many times and accidently uncovered the plot twist by doing so. However that was not the only thing in this book. This book was very much a set up for the next one, a very long prologue if you will. But that didn't stop it from being great. The way the action was described in this book made it some of the best action scenes that I have ever read. I would highly recommend it just for that reason. Alexandra is the kind of strong willed, sassy character which I think that we have all come to expect from Jennifer L. Armentrout, but I don't mind that she never species up her character's traits significantly, because she writes these kind of characters well. Alex make decisions based more on her emotions then on logic which more often then not gets her into very sticky situation but Aiden is always somehow there to get her out of them. She keeps all of her friends close and she protects them with everything she has which is a very admirable trait. She also has a bit of a mouth on her which she is going to need to tone down if she has any chance of staying in her school. But she does say a lot of funny things which lightens up the mood. 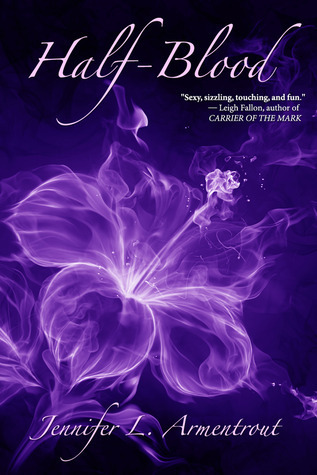 I can't wait to read this when I get to it :) I adored Obsidian and Daemon Black is one of my bookish boyfriends. I also loved Jennifer's writing style :) Great Post! I'm so glad you liked this book! I read the series a little while ago and loved every second of it! I still reread it once in a while when I need a good series to wipe another book from my memory :) I hope you enjoy the next book!